Though beautiful, tanned bodies are still all the rage, news on the dangerous effects of tanning beds has permeated even the most body-conscious sectors of society. Today, even popular celebs are slathering on sunscreen and opting for a "fake bake" instead of the real thing. Here's why. People go to tanning beds to get a tan. Tanning beds are designed to offer maximum body coverage for an even tan, top to bottom, front and back. Unfortunately, all that light exposure is very damaging to your skin and eyes, and can cause other, more serious problems. Tanning beds in the United States date back to the late 1970s. They rely on fluorescent lamps to emit ultraviolet radiation that turns skin brown and many people never stop to consider whether tanning is actually safe. Here are a few quick facts about cosmetic tanning in tanning beds and booths. Most tanning beds emit primarily UVA, which raises your risk of developing melanoma, a deadly form of skin cancer. The younger you are when you begin tanning, the greater your risk of developing melanoma. Tanning beds and booths emit more ultraviolet rays than you would be exposed to during the same amount of time in the sun. Some studies show that tanning increases premature skin aging. The use of tanning beds has also been linked to several serious eyes problems, such as retinal damage, conjunctivitis, and corneal infections. 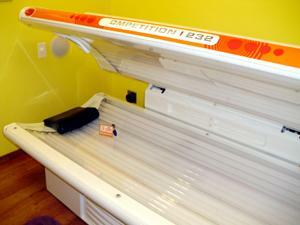 The World Health Organization has called for a ban on teenage usage of tanning beds. Only about half the states in the U.S. have regulated teen usage, however. Tanning beds can cause sunburn, a painful condition that leaves the skin red and dry. Studies prove that just one incident of sunburn can increase the risk of developing skin cancer in your lifetime. Real tanning is dangerous, but many companies and boutiques now specialize in fake tans. Here are just a few options that can help you get bronzed without the dangers associated with tanning beds. Spray Tans - These tanners use a chemical agent that technicians spray on your entire body, and when dry, gives your skin that tanned look without the UV exposure. These tans can last anywhere from four to ten days. Because they do rely on a several different chemicals, spray tans may irritate some people's skin. Also, please be aware that spray tans will not prevent you from getting sunburn. Tinted Lotions - Many companies have now jumped on the self-tanning wagon. These lotions are created for home use and can be applied easily and quickly after a shower. There are a variety of brands on the market today and their effectiveness depends not only on the product, but also on your skin texture and tone. This is one of your best and most cost-effective options for a safe tan-free tan. Suntan - This is the real deal. If you truly want to forgo the lotions and sprays and go for a true tan, it's still a better option to lay by the pool than it is to tan in a tanning bed. You can't turn back time and undo the damage done to the skin from the effects of tanning beds, but you can take care of your skin from now on. Here a few quick tips to help you bring back your glow. If you've experienced sunburn, use an oil-free lotion or aloe vera to soothe hot, dry skin. Keeping the skin moist is very important. Begin using a daily moisturizer and a night cream. Apply to face and neck regularly. Purchase makeup that includes an SPF of at least 15. Many daily moisturizers also contain SPF, as well. Wear sunscreen on all exposed areas of the skin during daylight hours. The peak sunburn times are between 10 a.m. and 4 p.m.
A truly beautiful body is one that is healthy and free from damage. While it's okay to want to look your best, it's important to choose products and activities that will help keep you happy, healthy, and strong for years to come.